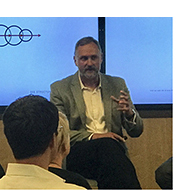 September 11, 2017 – Jason Pederson recently participated as a panelist presenter at the annual Upper Midwest Lean Construction Institute Workshop, sharing themes of Meyer Borgman Johnson’s lean journey with an audience of design professionals, contractors, fabricators, and academics. During the first half of the presentation, speakers shared their experiences of using lean processes to enhance projects and described the integration of lean thinking into their firms’ practices. The second half of the event was a structured brainstorming exercise to gain further understanding of how the community sees waste in the d esign process and what can be done about it. Jason has led MBJ’s lean thinking initiatives for 7+ years, guiding the alignment of the firm’s culture while integrating practical applications of lean methods within the design and construction industry. He is a member of the nationally-based Lean Construction Institute, as well as an active participant with the regional LCI Upper Midwest Community of Practice.